Today I was privileged enough to be taken on a tour of the British Newspaper Library, which is based in Colindale, North West London. Every newspaper owner in the UK and Republic of Ireland are obliged to deposit a copy with the library as part of its legal deposit. The earliest items in the library date from the seventeenth century. The library holds 750 million pages of newspapers, journals, newsletters and even football programmes, of which the latter is stored away in a secure part of the library buildings, with the other items considered precious. I have regularly made to the trip up the Northern Line to visit the place since 1992 to research football’s history, but this was the first time I had ventured into the inner workings of what I regard as one of the finest archives in the UK, if not the World. Bound volumes on a stack in the repository. The British Library bought the land in the Edwardian period to relieve stock overcrowding at its London base. Horse and cart delivered requests for newspapers to London from Colindale. It was not until 1932 that the building was first opened to the public. The Second World War was disastrous for the library, a German bomb exploded in October 1940, destroying 6,000 bound volumes, which were lost forever. Subsequent extensions to the library bring it to its current size. The collection is stored on several floors. The items located nearest to the reading rooms – behind the double doors marked “staff only” are the catalogue collection marked “MLD”, which relates to London-based periodicals. Now I know why my microfilm copies of The Sportsman or The Sporting Life always arrive quicker than requests for Scottish or Irish newspapers, which are located further away in the Library’s holdings. My tour guide told me that readers must make sufficient requests from a certain part of the building before they will retrieve material. This is why it can take up to an hour for a paper to arrive after its original request. Having seen the racks of bound newspapers, we were taken through to the Microfilm Department, which turns paper copies into microfilm for viewing. A row of men and women were diligently making microfilm copies of new and old newspapers. All acquisitions received after 1986 are now archived in this manner to preserve the originals. These are now not bound but placed flat into acid-free boxes. The Bath Journal from 1888 was one such newspaper I spotted getting microfilmed – no doubt saving the original from further deterioration. We turned a corner to see more staff with their irons – not for their clothes – but carefully flattening newspapers ready for microfilming. It must be hard to keep concentration in this windowless environment but their service and reputation is second to none. Most are local employees and live within a couple of miles of the library. After the microfilm negative master is created, library staff checks every frame by human eye to ensure there has been no mistakes or pages missing, a pain-staking task. The master is then stored in the basement. A staff member ironing a newspaper ready for microfiliming. I asked a question on items unfit for use, such as damaged newspapers, and what was the programme of repair to get them back in the catalogue? Unfortunately, there is no systematic plan to get the unfit items back into use. 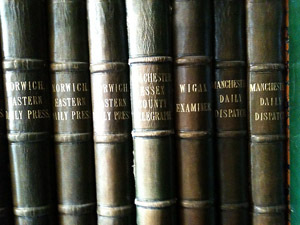 A bound volume costs around £500 to repair, compared with £50 to microfilm the contents. Given the impending move, I don’t expect the situation to change. It seems if you want something repaired in order to view it, be prepared to lobby vigourously in order to get it. The Newspaper Library’s days are numbered at Colindale. They have simply run out of space and the lease on some of the buildings is at an end. 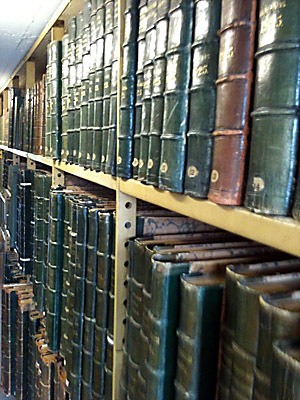 Therefore, the majority of the library’s holdings are to be transferred to a new purpose built storage facility in Boston Spa, near Wetherby in Yorkshire. 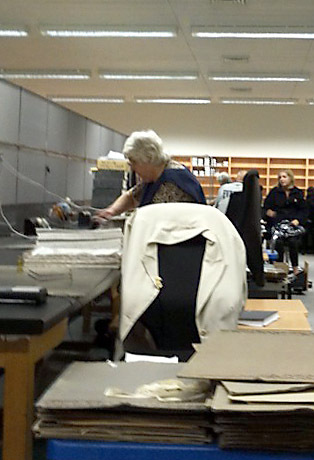 The microfilm stock – a staggering 400,000 reels – will be located at the British Library in St. Pancras. I was informed at the end of the tour that the library has plans to digitise 4 million pages a year for the next ten years in partnership with a private company to supplement its current digital holdings website. Because of copyright issues, the vast majority will be newspapers published before 1900. It sounds an impressive total but when you think that will only cover around 5 percent of its present holdings it’s a very poor return. Funding, as ever, stunts the growth of the digitisation programme. The current cost to digitise newspapers is estimated at one pound per page so 750 million pounds for the entire collection in this economic climate is out of the question. This has repercussions for the 2012 move. If you wish to consult regional newspapers from the twentieth century after the library leaves Colindale, you will almost certainly receive a worse service than at present. It’s not even guaranteed that readers will able to view bound copies at Boston Spa so lobby your local MP to make sure it does. Free tours are conducted every two months or so and are strongly recommended before its contents disappear to Yorkshire (the process starts later this year) and the building shut. It is not listed and its likely replacement is a housing development or University campus. Whilst the longer opening hours in the new Central London base will be welcomed, one has become fond of the slow pace of life at the Newspaper Library, with staff bringing the volumes in barrows. It has a sleepy 1950s feel to the place that will be sorely missed. This entry was posted in England's amateurs, Research process on 5 May 2010 by Mark Chapman.